IAPS was delighted to host Professor Antonio Donini, the former Director of the UN Office for the Coordination of Humanitarian Assistance (OCHA) in Afghanistan, as he delivered the annual Tomlinson lecture. 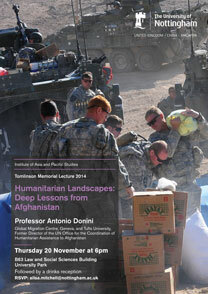 Professor Donini detailed how for a long period of history, Afghanistan served as a laboratory for humanitarian action. He also detailed how humanitarian action has evolved following the operations in Afghanistan. He noted that Afghanistan faced a significant crossroads this year, either a return to state collapse, witnessed during the 1990s, or more inclusive governance between the different ethnic groups and an uncertain peace. Professor Donini argued that prior to the 1979 invasion by the Red Army, the majority of Afghans benefited from Cold War rivalries as both Washington and Moscow sought regional influence by providing infrastructure and education during the decades of the 1960s and 1970s. However, following the Soviet invasion, over 3.5 million refugees flowed into neighbouring Pakistan, with 2 million streaming into Iran. Along the Afghan-Pakistan frontier, a cottage industry sprang up with some humanitarian agencies actively supporting the mujahedeen against the Soviets. In the 1980s it was very difficult to maintain neutrality. Humanitarian agencies were only accepted if they supported one specific mujahedeen groups. Mujahedeen commanders drew legitimacy from garnering aid from humanitarian agencies.During this period, Afghan tribes and local commanders would convene shura’s (consultations) to attract NGOs and humanitarian aid. Professor Donini told the story of one Pushtun commander using a vaccination programme to extend his control, and his attempt to prevent Tajiks from receiving the vaccine. Following the events of September 11th, the 2001 Bonn Agreement saw the United Nations and wider international community rally behind an interim Afghan government under Hamid Karzai. In October 2001, Secretary of State Colin Powell referred to humanitarian agencies as force multipliers. Many of these agencies were the recipients of large amounts of development aid from Western governments. Many of the humanitarian agencies active in Afghanistan, alongside the UN and UNHCR were accepted begrudgingly by the various warlords and tribal groups. During the initial years of the ISAF intervention, there were very few incidents of attacks on aid workers. However, in the Pashtun rural areas, NGOs were seen as part of a western hegemonic agenda. The Taliban viewed aid workers not as ‘benign infidels’ but rather the direct symbols of United States imperialism. As a result, between 2002 when the UN had access to 95% of Afghanistan, in 2010 NGOs had access to less than a fifth of the country. How has West ern humanitarian aid changed Afghanistan? Firstly, aid agencies brought in technology into urban and rural Afghanistan: including mobile phones, social media and other means of communication. This changed society. Previously the Voice of America had been the only voice of the outside world. NGOs also bought in new ideas: including a rights based gender discourse and the western model of democracy. The presence of well financed missions from the United Nations and private NGO’s also created new elites in Afghanistan. Those Afghan staff trained and paid by the UN are now key business figures, parliamentarians and educators within Afghan civil society, at least in urban areas. How has Afghanistan changed western humanitarian aid? As violence escalated, international aid agencies were withdrawn into fortified compounds, beyond the sight of average Afghans. The United Nations headquarters in Kabul increasingly resembled a bunker, with the Afghan capital becoming home to archipelagos of fortified buildings. This negative trend led to remote management. Local staffs were embedded in rural areas but few senior staff left the major Afghan cities. Those that did had to travel under ISAF protection, implicating them with the US military. Finally, under the pretense of humanitarian action, counter terrorist operations have been conducted. Under a fake polio vaccination program, the Central Intelligence Agency (CIA) located Osama Bin Laden. Since 2011, polio vaccinations in Pakistan have been impeded and aid workers killed as a result of this CIA intervention. Although humanitarian action has never been so well endowed and well-structured ($100 billion has been spent in Afghanistan – more than the Marshal Plan following World War II.) humanitarian action never been seen to be more well aligned with western foreign policy. As such Afghanistan has given humanitarian action a bad name in many parts of the world. What went wrong? The return of insurgency was linked to the failure of the reconstruction process, with many Afghan disillusioned by the international effort. Attacks on aid workers were no longer taboo and became part and parcel of the war. Looking forward, what we have in Afghanistan today is a nation building effort in deep crisis. In 2001 there were high expectations; Hamid Karzai claiming that within a decade Kabul would be like Dubai. The use of humanitarian aid for political gain very rarely works; in Afghanistan the blowback from the 1980s continues to this day. Shanghai ditches GDP targets: Does it matter? 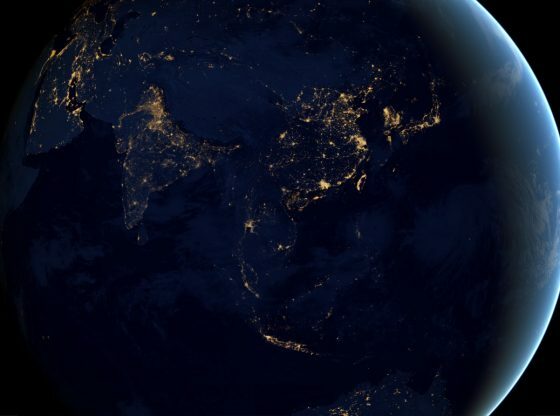 The other ‘pivot’: Is Russia also rebalancing towards the Pacific?